Customer pays for "Flight" ticket. Current 2/3/19 ave. United cargo price $335. 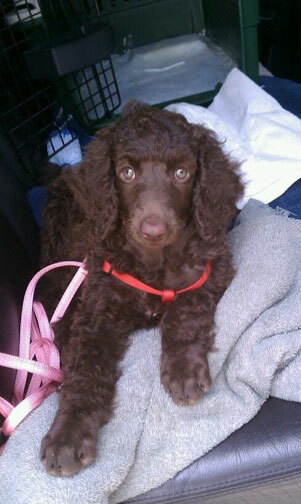 I pay for pup's health certificate and crate/carry-on bag in your puppy price. For TX customers, I pay for the TX sales tax on a pup. It will take your time to read through or print off this page to help you know what to plan and expect. If you fly cargo to your state, I do not have to pay TX sales tax due on any pet sale out of state (sales tax est $169 in my Bastrop County 6.75%). You must check with your state to possibly report and possibly pay sales use tax in your state. See your states "Use Tax" requirements. Being an ethical citizen. 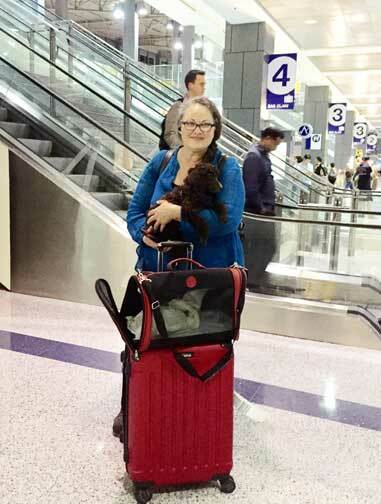 In your flying into TX to pick up your puppy and take as carry-on, you have paid final payment two weeks prior to getting your pup, thus NO TX sales tax is required. Don't hesitate to contact TI with questions after studying this page 737-932-5030. TI is allowed to sell puppies via the internet and fly pups at 8 wks of age as she is NOT under USDA requirements in having only 3-4 breeding dams. If you need to pre-pay for flight ahead, you may pay for flight with the tab below when ready...there is a 3.5% fee for using this method. A $10 S&H charges comes up at checkout which makes up the rest of the 3.5% fee. 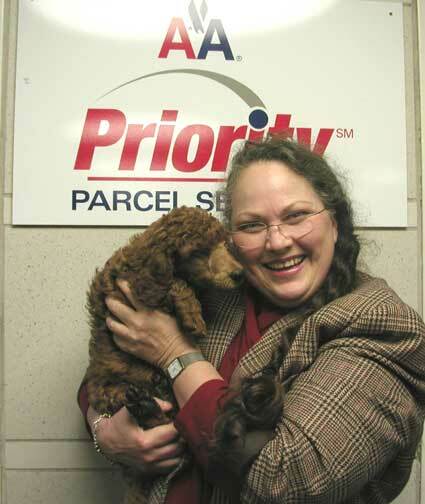 Standard Poodles Traveling Pets as cargo - above; puppies are flying every day around the world - Royal "Carlo" is being picked up by his owner in Maryland at their "cargo facility" or picking them up at "airport baggage pick-up area" below picture if cargo arrives after normal hours. Crates are paid for in pup price at 8 wks old fly out date...they grow out of the crate by 9 wks so important to fly at 8 wks old! Crate prices that you can see: United crate prices - size used > 28" x 20.5" x 21.5"
A health certificate is completed for ALL out of state travel, paid for in your pet purchase price. It's the law. #1 shipper: Tes Ingebritson > 142 Zimmerhanzel Rd, Flatonia, TX 78941 > 737-932-5030 ... POSSIBLE if weekend #2 shipper Sue D'Antonio contact information at time if works in her schedule. Crate Series: NOTE! each airlines has varying dimensions of a crate for each of "THEIR series"; like "200 series", or "300 series" ...Tes has found the "200 series" (28" x 21.5") is the one to give them upon initial call set up for 8 wk old pups! Once I drop off pup at each airline, they determine then per their dimensions. 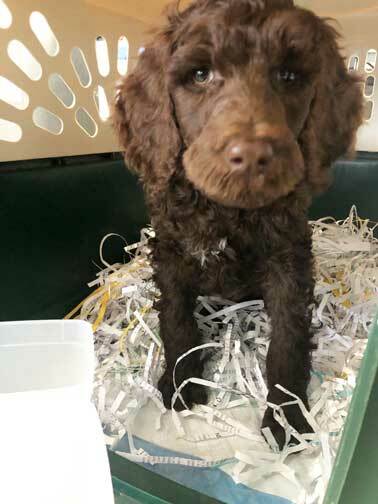 Weight of pup with crate varies from 20-25 pounds, 8 wks old. Ask if you can pre-pay for flight or once I drop pup off, call you and you use your credit card to pay at that point. AUS - Austin Bergstrom International Airport > ALWAYS site fly-out date set for litter! 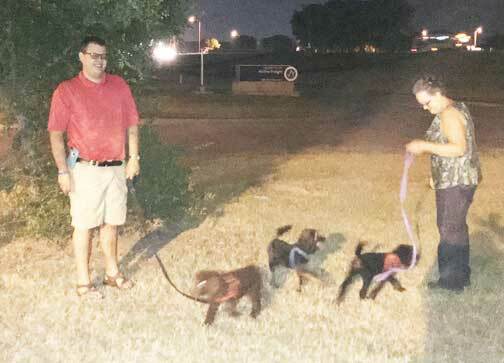 IAH - Houston, TX > can be Saturday after fly-out date set for litter. SAT - San Antonio International Airport > after fly-out date set on site for litter. UNITED - IAH Houston is a 7 hour round trip for TI with $$ HWY tolls, so coordinating everything is imperative - GOOD communication! TI also prefers to fly pups out on a Saturday from Houston. UNITED ONLY! Information from United MUST be received 10 days prior due to United's new regulations of pictures needed and them to validate via email...sometimes back and forth to the 5 day prior limitation to allow flying out. e) 9+ wk old pup: flights set with travel charge. Below, Bodhi arrives at cargo in WA. a) 8 wks old cargo, this is the reference information for 90% of our puppies flying out: Crate size for our larger pups 28"L x 21"W x 22"H. Pup + crate will = 20-30 lbs estimated flying price up to $300-$400 (Alaska) - 8/18/16. Our pups on average at this age will range from 8-15 Lbs. As they grow, crate size must change with their weight, be aware the cost rises gradiently to fly larger pets. b) Purchasing 2 pups at the same time: a) check with the airlines to know IF a larger crate (size 36" x 25" x 27" or 300 series) can be used to carry both pups together, that will entail finding out what *size airplane will be carrying the pups. b) IF the plane won't allow the larger crate, the 28" x 21" x 22" will have to be used to either carry both pups in it (if they fit), or c) two crates carrying them individually flying out at the same time. c) Smaller crate size for an occasional smaller puppy: 26"L x 16"W x 16"H - estimated flying price now up to $300. D. Ask if you can pay for flight on your end! E. Three major airlines are provided below that you can drill ahead to know which airlines will work best for you/TI. You can find another airline if you so choose...always send TI what you find and want to plan for a schedule. I must coordinate all of these for timing. In working with your desired airline carrier, Ask them where you are to pick up your pup! Locate where the cargo or pet arrivals come in that you can drill ahead of time its location and be there when the pup arrives. Some come into the baggage claim area of an airport and cargo may come into a totally separate facility from the airport. Winter - later morning flights for heating up of the temps in that day. It is the customer responsibility to do the booking of the flight, following up with the itinerary sent to Tes via email with its reference number...TI will work logistics depending on your plans…I call and validate with airlines and check off on checklist in your file. It is DEFINITE GOOD communication in at this time! TI must arrive 2.5-3 hours ahead of time for most airlines. When scheduling your flight, ask what time flights go out in the morning. Some airline ports may only have one fly in time (to you), thus it is important you know what they are to let TI know. Example: Delta cargo opens at 5am...the earliest flight out for your pup with Delta cargo must be at 8:30am...Delta DASH allows 2 hrs but will cost you another $100 for price? TI calls you upon pup drop off, CAN BE VERY early morning hours, be expecting it :o) Then TI expects customer to phone within 2-3 hrs of pup's arrival that she knows pup is in your loving arms. TI may not hear cell upon different interactions so do leave a message and she will respond asap! Have water and rag available to wash pet off as they may have soiled in travel. Lots of shredded paper is there for absorption. Pup has been washed at 6.5 wk age so please don't over wash with another detergent...warm water rinse is good. Look for any final paperwork as noted per our emails taped under the pee pad/shredded paper. 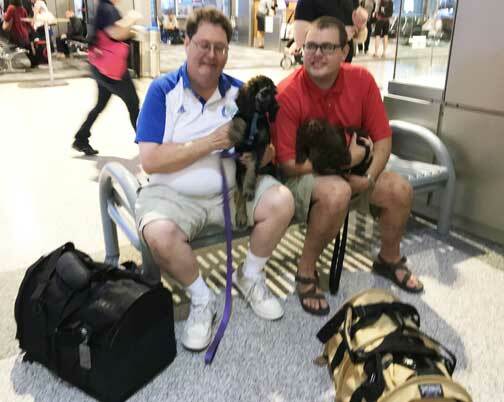 This is from a recent United brochure TI picked up 7/22/17: "We prioritize the safety and well-being of pets through every step of their journey with PetSafe. 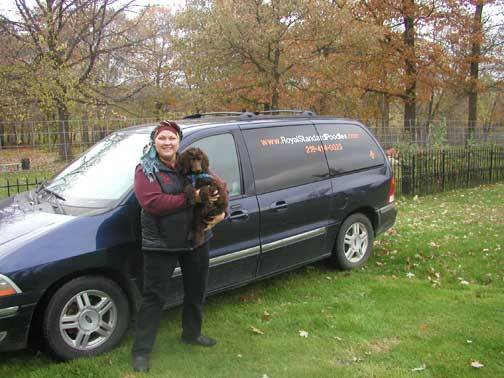 We have more than 70 custom-designed, climate-controlled vehicles to safely transport pets in all weather conditions. 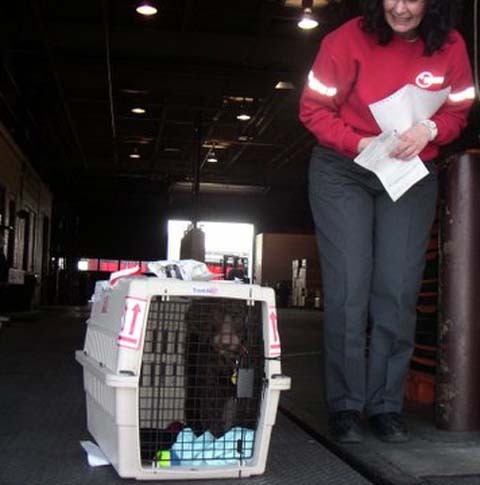 As a part of our loading process, pets are placed onto the aircraft last and removed first to minimize stress. 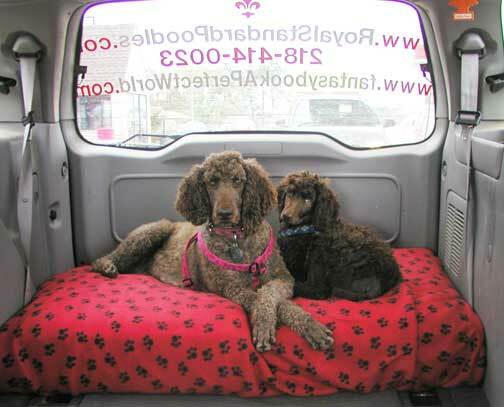 While in the air, pets remain secure and comfortable in climate controlled, pressurized compartments. Our deluxe onsite pet hotels and offsite facilities accommodate pets during long connection times and before international travel." a) Carry-on pup age is 8 wks, health certificate is NOT clearly called out yet will always be provided. d) Note: review their restrictions on the link above. 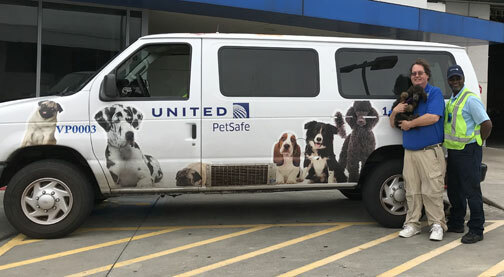 e) United can fly pups to warm and cold states with their Petsafe program, temperature controlled environment year round! f) Can book as earlier as 2 months ahead. g) 8 wks of age is when TI agrees to fly all pups for free, if in deciding to take pup as carry-on/cargo at a later time then we have established for the litter there will be an additional traveling charge of $100. h) You must pay TI for shipping before pup flies...unless they agree to take your phone call cc payment. Customer sends estimated price (ex. $300-350) for travel prior to any pup flying out. Make sure you have drivers license/ID in hand upon pick up. This includes the average airline cost, plus taxes, and then any variable of TI needing to handle the expense on this end. NOTE: 11/22/2013 there is confusion by consumers of what age Delta will take a pup as "Carry-on." 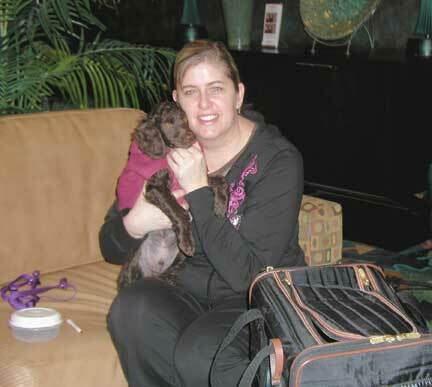 On 11/19/12 Delta changed pup "CARRY-ON" age from 8 wks old to 10 wks old, within the USA at the link above. See "The following restrictions apply to pets traveling as carry-on baggage:"...bullet 5...for Domestic and International. In a phone call to the USDA and being guided by that agent, the US Air Consumer government rules link in #1 at top clarified that INTRA USA flights MAY be done no younger then 8 wks old as carry-on as well as cargo. IMPORT and EXPORT are a minimum of 10 wks old. Airlines have the right to make their own rules and regulations for age as Delta did. I believe this walk through should help make clear what age Delta allows carry-on which is 10 wks old. Note: our pups will range from 8-15 lbs at 8 wks old. At Delta's 10 wk age our pups would be too large to fly as carry-on thus a different airline is recommended to fly at 8 wks of age for carry-on. c) 8 wks old is valid in Delta "Cargo", with health certificate required. e) You may book flights with Delta 14 days prior to known ship date. Delta has ended up telling customers 13 days even though the site states 14 days/2 wks. f) You pay for pup's flight upon its arrival at cargo pickup. Make sure you have drivers license/ID in hand. g) 8 wks of age is when TI agrees to fly all pups for free with no travel fee. h) Delta Dash to smaller airports: In the past years it was simply stated with DASH - "Breeder must pay on their end at time of drop off for flying of pet." In the last several years, they have started to ALLOW owners to put their credit card on record as the "pre-pay". It isn't charged until breeder brings in pet. 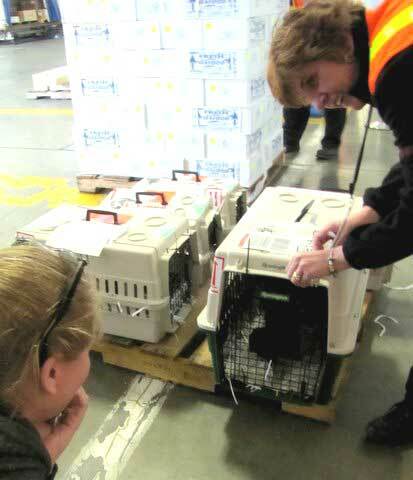 In Pre-paying by this manner, the customer is allowed to then book their pet's flight, not the breeder. The ONE thing I note on this way of pre-paying, I have had to call the customer at the DASH counter (5am in the morning, and depending on your location can be even earlier morning hours) to have the agents validate the credit card. Any delay in this communication could mean your puppy misses their flight. If they do not allow you to pre-pay, you must pay TI for shipping before pup flies. With that TI asks for an additional $30 from what they tell customer flight cost may be as usually the weight may be more along with taxes...any left over funds are used for gas :0) Thank You! i) Customers in warmer states: Delta cuts off flying animals in cargo when temps reach over 85 degrees in summer months. If from a warmer state, consider the cooler months to purchase your pet or traveling with your pet as "Carry-on." Otherwise, United Airlines flies animals during summer months in temperature controlled environment. a) Carry-on pup age is 8 wks, health certificate IS required with American Airlines carry-on which we include in your pet price. 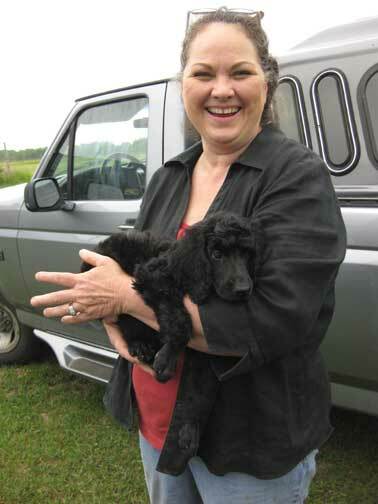 Their notes: Pet Carrier Guidelines for Cabin Pets > The maximum size for cabin pet carriers is 19" long x 13" wide x 9" high. 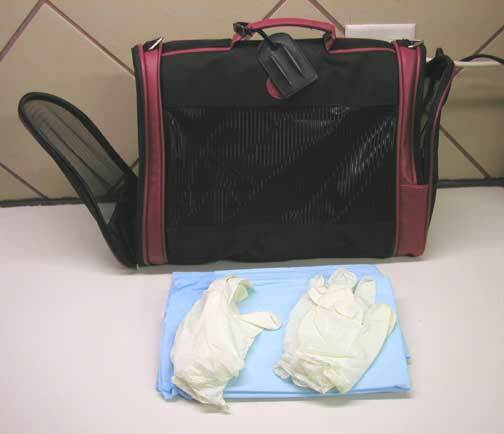 Soft-sided pet carriers such as Sherpa bags may exceed these dimensions slightly because they are collapsible. Animals must be able to stand up, turn around and lie down in a natural position in the kennel. Soft-sided pet carriers are accepted as long as they are constructed of water-repellent, padded nylon with mesh ventilation on two or more sides. TI is researching to find a carrier that meets these dimensions. The one TI currently uses is taller then these dimensions, not as wide. b) Generally their cargo has two stops at major ports for the pup/s, health certificate IS required. c) Note: review their restrictions on the link above. d) 8 wks of age is when TI agrees to fly all pups for free, if in deciding to take pup as carry-on/cargo at a later time then we have established for the litter there will be an additional traveling fee of $100. e) You must pay TI for shipping before pup flies. Customer sends estimated agent price (ex. $350) for travel prior to any pup flying out. Make sure you have drivers license/ID in hand upon pick up. This includes the average airline cost, plus taxes, and then any variable of me needing to handle the expense on my end. Above: sometimes my good friends D'Antonios travel and can take pups as carry-on or meet you at the Houston, TX airport with your pup, or fly cargo out from Houston - United ONLY is there preference. CARRIER may vary...have wheels/or not...depending on size of your pup/airline...the below is MOST used. PLEASE mail back to us - around $20! In planning to travel with your pup, I have found it is important for you to purchase the "Cancellation option". Life Happens and it has happened individuals could not make it losing out on their purchase. Morning flights work best for cooler weather and due to bringing other pups to fly cargo, yet will always do best to accommodate the customer. See major airlines in section #1 above, each link will cover carry-on. Some flights have limits of how many pets can be carried on a flight so important to study ahead. 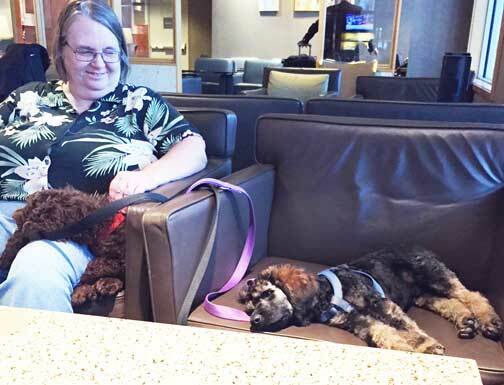 Customer pays for pup's flight. Make sure you have drivers license/ID in hand. Health certificate is paid for in pup price, some airlines do not require it for carry-on, yet TI will provide one at all times for flying your pup. 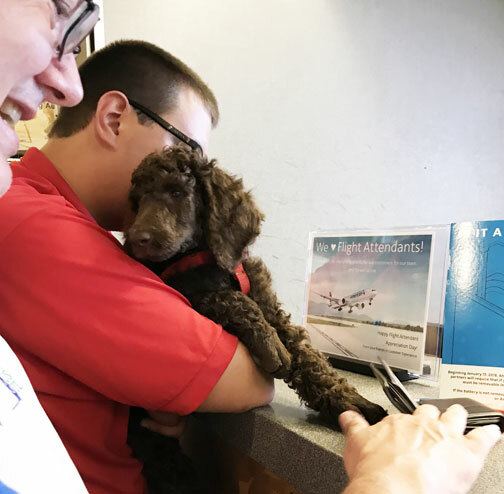 Pups can be taken on as carry-on up to a certain weight limit, so do not plan on an older pup to do this with as our Standard Poodle pups at 8 weeks old will range from 8-15 lbs. IF you stay the night before, most hotels provide shuttle buses to and from the airport. a) I prefer to meet you at your hotel or; b) can be at the airport...depending on airport. 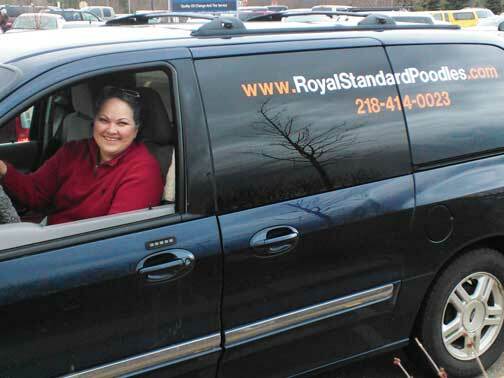 In staying over night, we need to plan at least a half an hour to finalize paperwork where we then give you and pup a ride to the airport several miles away, assuring all goes well for your flight back if you do not take a shuttle bus. Health certificate is paid for in the price of your pup. Customer will receive pup with the above style carry-on (may vary). Please understand, we have found this style to be the best in using as carry-on. Do not try to buy or send me a different style. Carry-on dimensions of bag are around (these are somewhat squishable dimensions due to the flexible material for placing under seat) 10" Wide x 9" High x 18" Long. Once flight is in the air you may be allowed to place carrier on your lap at which the ends unzip and you can pet and comfort your pup. 4 puppy pads are provided, a folding water/eating dish, a washcloth, and 2 pair of rubber gloves. Below is "Hilo" with his owner traveling with him as Carry-on to New Mexico. After flight decision booking made, you then inform/email TI your flight plans/itinerary so logistics can be worked. TI must plan to get you to the airport at least 2 hrs ahead of flight. Leash...and love :0) Ti provides step in harness. 1. All flights are arranged and paid for by the new owner. TI provides information here to help along the way. This gives one knowledge to what Standard Poodles must go through to fly as well as surety in knowing what airline choice is made and their rules. TI has flown MANY pups over the years of breeding...your planning and communication is key for this to run smoothly! When pups are born, TI posts the "8 weeks" later traveling/flying your pet date for customers to know. This is going to generally be DURING the week so plan accordingly. Airlines do not "generally" fly as many flights on weekends. 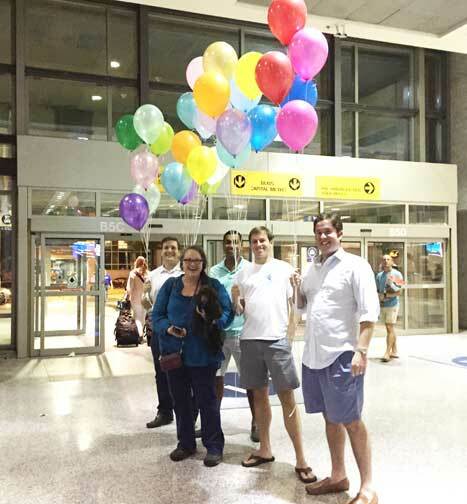 As long as everyone can plan together for the same day TI will never charge travel expenses! TI pays the flying health certificate for your pup which must be done within 10 days of your pup flying. Alaskan flights DO cost more - $400+. If shipping your pup at a separate date than the others for your convenience, see notes in #1. The night before TI goes to bed at 6pm to get up at 1am to Houston, so please do not call after that! TI uses a dog's mother pheromone spray (fragrance of the nursing mother) just before they leave to help relax them. 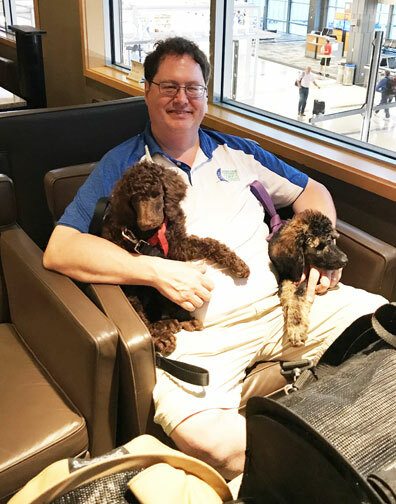 It is a new age in the pet flying world today, feel comfortable in knowing that your pup is being taken care of on the trip. Good communication is imperative when working through the flight phase, that we can know what is to happen and when. Overseas buyers; please thoroughly research who your transporter will be in understanding their requirements in #1 above, research your countries import animal rules. Example: Government rules and regulations, how old must the pet be to fly to your country, quarantines, and needed shots. Be by your phone and assure we have your cell phone number/s!! 7/22/17 TI attended the Houston World Series Dog Show and found Sonshinepets LLC, a pet travel agency that finds the best flights for pups flying into Canada. All coordinating must be done via TI and Sonshinepets by law, after coordinating flight you're then put you in touch with their agent. NOTE: This agency can do USA coordinating, yet TI has found it is only a savings of MAYBE $50 compared to the certainty customer and TI get when doing it between us, not bringing in a 3rd party. 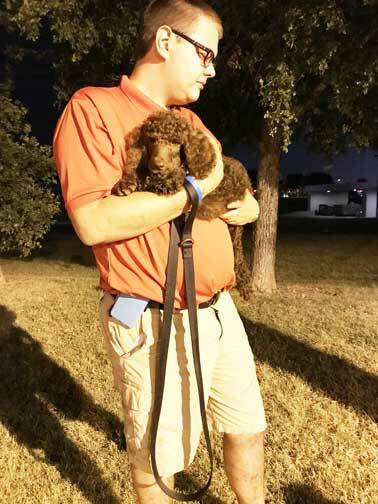 If driving to Texas to meet Tes on the flight date, one can meet at United cargo in Austin, TX to pick up your pup that morning, we can coordinate. a) I personally cannot ride in the back seat of a car without getting car sick, something about ones ear balance...thus my observation is the same with pups up to one year of age...I do not crate them and do not recommend crates while traveling if I want vomiting and their equilibrium to be lost...it's inevitable until they get over 1 yr old and their body stabilizes with balance...I personally don't see my older spoos vomiting once older...if so, I highly recommend chiropractic adjustment to check their atlas and balance alignment. b) I need to be able to consistently look forward to avoid nausea, thus I try to work this with a pup/or adult spoo. Adult spoos are taller and have the opportunity to look out the window ahead. Pups can't, I place a towel on the seat beside me...I may have a riding harness to strap a pup or adult in, the Lupine harnesses work by sliding the seat belt through the back of the harness...or not if I want them to snuggle next to me (I need that ;o)..., or towel on my lap and carry the pup there. They will throw up, it's inevitable...the towel catches it that I can shake it out once stopped. Have MANY towels and a bag available to put them in for washing later. c) have jug of water, wash cloths, towels available for traveling to switch out, wash you, them, vehicle with...maybe some air freshener ;o)...it's inevitable and I want to comfort them instead of being back in a crate all alone...especially leaving family all behind and new environment...I want them comforted, looking forward the best I can get them to and knowing they have someone loving them in all this experience. d) I do my best to travel at night that they can sleep through it all...they don't get ill then...when I drive a distance with another person I must sleep, or drive...I love the pet beds with the puppy smells to comfort them, they love it too...if traveling by car with them the pet bed truly helps with smells of home and comfort, the towel ready to catch what comes up. 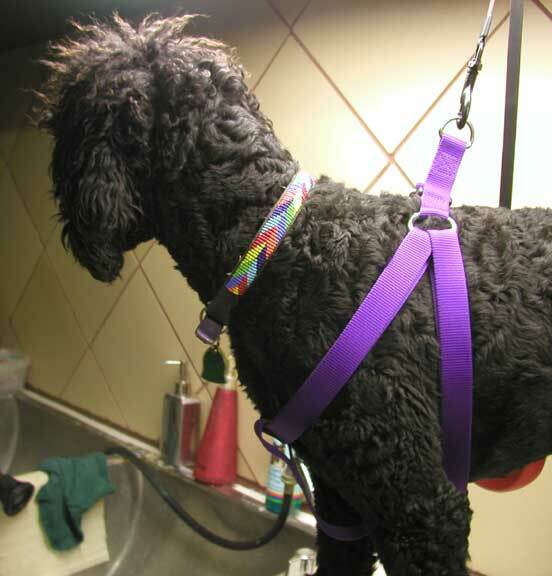 We are not crate trainers, that is why the car seat harness. 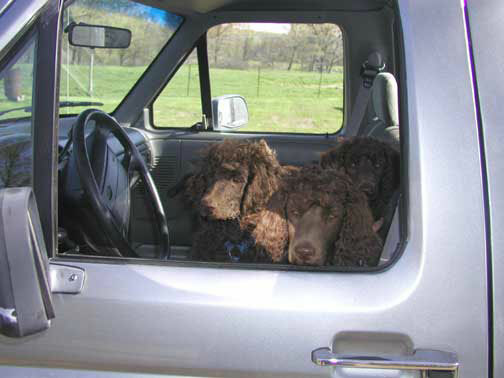 If you crate your pets, of course bring your crate...and know they WILL get car sick on a long drive! Health Certificate if out of state. By law this is required. If long distance travel, dog food to travel (fed at night). Check the weather for your flying date. Weather.com is what the airlines use to check temps.